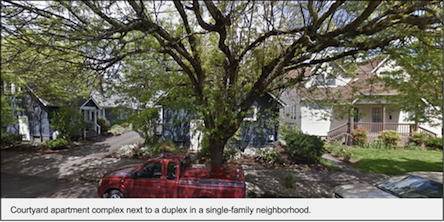 The SE Portland block I live on offers a snapshot of the city’s residential development eras. There are a couple of single family homes that were built in the 1890s. There are a handful of modest single family houses built in the late 1920s. There is a two-story 30-unit apartment complex that was built in 1972. And sprinkled in there are a pair of attached duplexes built in the 1950s and a stately four-square home that is divided into five separate living units. While my street is a true hodgepodge of architectural style and living arrangements, all of the lots have one thing in common. They are all zoned R5 (one residential unit for every 5,000 square feet). If all of the homes on my street were removed and the street was redeveloped to today’s R5 standards, the street would look very different. The duplexes would become single family houses, since duplexes are only allowed to be built on corner lots in R5 zones. The 30-unit apartment complex would also be forbidden. In its place would be three single family homes. The four-square home could still be built (at a slightly lower height), but it wouldn’t be allowed to have separate living units. The absolute number of housing units and people living on my street would be greatly reduced. It is likely that the income and demographic diversity of the people living on the street would be different, as well. While my street may be an extreme example of varying housing types, there are many other streets in Portland where apartments, duplexes, fourplexes, townhouses, and smaller multi-family buildings are mixed in with single family homes. This is especially true in the neighborhoods that developed during the streetcar era. Many of these streets, including mine, have a distinctly residential feel to them. What they also have is something that I like to think of as “hidden density”. Density is a term that means different things to different people. The type of density that I see attracting the most attention – both concern and support – are the four-story multifamily buildings that are being built along Portland’s corridors. Good, bad or somewhere in between, this type of density is distinctly not hidden. The empty lot or one-story building is replaced by a 45-foot tall building. The change in scale, as well as the difference in scale from nearby single family homes, can seem dramatic. The density on my street and elsewhere is not as apparent because the density is occurring in buildings that are largely at the same scale as single family homes. A duplex can have the same footprint as a single home. A four-plex can, in fact, appear to be a single home from the outside. An Accessory Dwelling Unit in a garage and/or a basement can add to the housing supply without changing the outside of a single family home. Even a well-designed courtyard apartment can blend in wonderfully with adjacent single family homes in many parts of the city if it is done right. All of these housing options can increase the number of people living in a neighborhood without building higher. In some of these cases, density could be increased without knocking down a house and replacing it with multiple houses. The hidden density I describe isn’t for everyone and it might not work in the context of some neighborhoods, but it should be part of the conversation Portlanders are having about how and where we want our city to grow, especially in light of rising housing costs and concerns over incompatibility of new residential development. 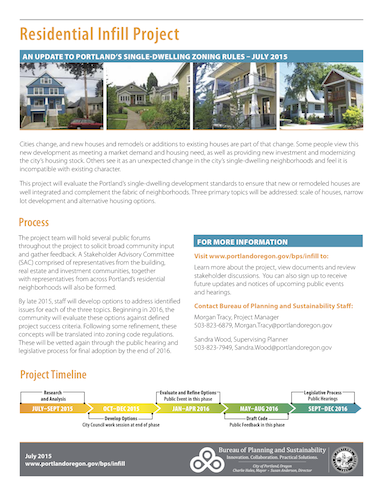 This month the Bureau of Planning and Sustainability is beginning a project that will examine the residential zoning code and that will explore the feasibility of the housing options I have described. I’d encourage you to take a walk along a street like mine, think about possible options for blending the new with the old and to participate in this project.